✓ Immediately attractive about the Elite is the range of cooking methods it offers, from baking and broiling to searing and steaming. Other convection ovens offer a much smaller breadth of methods. 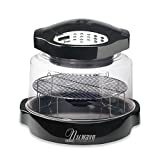 ✓ The conveniently compact design allows you to cook nearly anything right on your countertop: steaks, hamburgers, bacon, vegetables, fish, cookies, biscuits, pizzas and more. ✓ This oven is a major energy saver, using up to 85 percent less energy than your conventional oven. ✓ The combination of infrared, convection and conduction technology yields quick and even cooking both inside and outside simultaneously. Other conduction ovens do not yield the same evenness of cooking that the incorporation of convection and infrared technology allows. ✓ The unique cooking technology also boasts a 70 percent faster cooking time than traditional ovens. ✓ The Elite features a digital control pad that is intuitive and simple to use, making temperature control a cinch with its acutely accurate degree adjustment capabilities. It also features a delay capability. You can even program recipes into its Power Head, featuring a memory capacity capable of holding over 100 recipes. ✓ This model features a shatter-proof dome that others do not, as well as a reversible cooking rack and stainless steel liner pan. There are no concerns to be had about cleanup as the parts are dishwasher safe. ✓ If your kitchen cannot accommodate a traditional oven or such an oven is out of your price range, the size of the Elite is comparable to a countertop toaster oven while still boasting the abilities of a conventional oven at a lower price. ✓ The Elite comes with a one-year manufacturer warranty. For added peace of mind, NuWave readily offers an additional two years to their warranty for an added fee on their website. ✘ The Elite offers slightly reduced cooking space compared to the dimensions of a standard range, if you require the additional space. ✘ The advanced features of the Elite make it pricier than other convection ovens. ✘ The manufacturer’s warranty only covers the electrical components. If you want to fit those higher quality meals into your busy schedule without the spike in your electric bill, the NuWave Countertop Elite Dome Oven is the perfect addition to your kitchen. The power and features of a traditional size oven paired with the space-saving convenience of its countertop friendly design make this product an invaluable kitchen enhancement. If you cook professionally or for a living the Elite may not be best suited to you, but if you see meal preparation as a burdensome yet necessary commitment of time, effort and energy costs, the efficiency, breadth of features and ease-of-use of the Elite will come as an invaluable asset to your culinary obligations. NuWave Oven is an Infrared convection oven that uses three different systems simultaneously: infrared, conduction, and convection. Its manufacturer offers different types of models based on variety of temperature setting and cooking functions. In this article, we will review NuWave Countertop Elite Dome Oven which is the most advanced model available. See a comparison table of all NuWave Oven models on What Is the NuWave Oven? The Elite Dome Oven is a cooking appliance of many talents, boasting an impressively wide range of efficient cooking methods. Through its combination of infrared, conduction and convection cooking the Elite evenly and simultaneously cooks inside and out. You can air-fry, bake, barbecue, broil, dehydrate, grill, roast, sear, steam or even sou-vide cook. The NuWave Elite is 12″ diameter x 14″ H. It is large enough to roast a chicken or a small turkey. 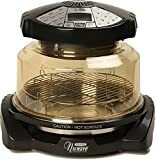 If you are looking for a model with larger space, you may want to check out NuWave Countertop Elite Dome Oven with Extender Ring Kit. The ring is 3 inches high so it will increase the height of cooking dome to be 17″H. 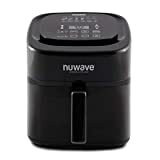 Related: How Does the NuWave Oven Work? Pressed for time or funds but looking to prepare a meal that is a grade above your usual fast-food or microwaved meal? While the Elite Dome Oven performs the tasks and capabilities of your average range, it actually saves you time and energy costs in the process. A cooking speed of up to 70 percent faster than a conventional oven saves you the time commitment of meal preparation. Therefore, it uses up to 85 percent less energy significantly lessens the burden on your electric bill. Part of the stress of meal preparation comes from the difficulty of navigating complex control panels on appliances to get things just right. One small slip-up can ruin an entire meal. The Elite Dome Oven’s design considers this and remedies it. For those overwhelmed by the long row of dials and buttons on a conventional oven, the Elite’s digital panel and button pads are a welcome component, conveniently and compactly located on the very top of the appliance. You can easily control the temperature in one degree increments from 100 degrees all the way up to 420 degrees Fahrenheit using the simple number pad. 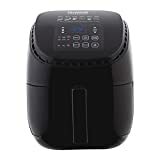 The NuWave Elite’s Power Head also boasts a programming feature that allows you to program your favorite recipes into its memory, holding an impressive 100 recipes or more. The simple, intuitive design of the panel and buttons put the preparation of that higher grade meal within easy reach. The unique NuWave Power Dome design allows for the circulation that results in quick and even cooking. It also allows you to keep easy tabs on the contents of the oven without the craning and peaking that a conventional oven requires. The amber dome that comes with this model is shatter-resistant and BPA free. If any of your NuWave Oven parts is broken, you do not have to buy the new oven. You can easily find a new part on the internet.